Medical Editor: M. W. Nicolle, MD, FRCPC, D. Phil. 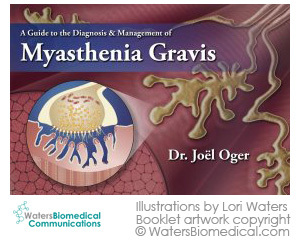 This longtime favourite, now in its third edition, offers an in-depth explanation of the clinical aspects of myasthenia gravis and congenital myasthenias, provides up-to-date information on medications and treatments, and addresses the emotional challenges and day-to-day concerns facing those living with MG. 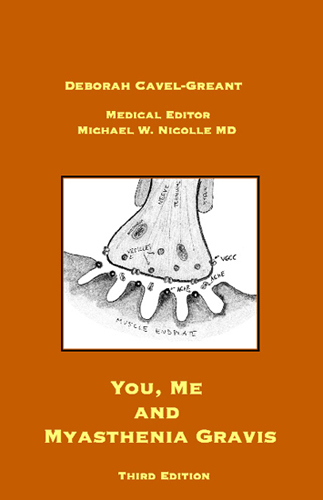 Reviewed by both the Medical/Scientific and Nurses Advisory Boards of the Myasthenia Gravis Foundation of America, “You, Me and Myasthenia Gravis”, third edition, is an excellent resource for the general public, offering insight and hope to newly diagnosed myasthenics and their families. To view two chapters of the book and to order a copy, please click here. By John C. Keesey, M.D., and Rena Sonshine. Originally published in 1987, this booklet is one of the most widely distributed brochures on myasthenia gravis in the United States and throughout the world. Dr. Keesey is Professor Emeritus, UCLA, and Rena Sonshine is an MG patient. By Jeanne Rhynsburger, R.N., CCRN, MICN, ACLS. Jeanne is a nurse, a wife, mother, a business owner, a popular speaker and an MG patient. Those who enjoyed the first edition of the MG Survival Guide, will find her second edition much more comprehensive and informative. If you would like to purchase either of these publication, please contact the Myasthenia Gravis Foundation of California. The slideshow for the above presentation is available for download as a Microsoft© PowerPoint Show. You will require either a full install of PowerPoint, Microsoft© PowerPoint Viewer (download here) or another compatible viewer. The following 1 1/2 hour audio and video presentation with Dr. Michael W. Nicolle was presented across Canada on Saturday, November 29, 2008. Note: After "the conference is being recorded" announcement at the beginning, there will be a 25 second pause before the video and audio begin. If you have any reference requests on myasthenia gravis, please contact librarian, Eileen Beany Peterson, M.L.I.S.